The Ultimate Illustrated Chinese Grammar Guide: Advanced Level collects and includes all advanced grammar points in a systematic way of learning. The content is presented with illustrations and includes abundant drills and exercises, making it an excellent reference guide for advanced level students and their teachers! Grammar points are presented with fun illustrations and come with drills and exercises, so students can learn to use sentence patterns to express themselves with precision. The dynamic and engaging design makes studying Chinese more interesting and increases student motivation. Grammar points are integrated into topics that deal with daily life. Learners that practice the sentences patterns frequently will find it easy to apply them to their daily lives. Grammar points are arranged according to level and difficulty. Sentence patterns are introduced gradually, making learning more enjoyable and less stressful. Grammar points with the same structure but different functions and usages are listed, so learners can compare and contrast them. The exercises and content are designed to give Chinese language learners a better overall understanding of Chinese grammar and to help prepare for different Chinese proficiency tests, including the TOCFL. The principles used in this book correspond to the language learning ability index—ACTFL and CEFR. All grammar points and vocabulary correspond to the TOCFL Band B (Level 3 and Level 4). Three TOCFL Band B mock tests are included at the end of the book, so learners can further evaluate their performance. 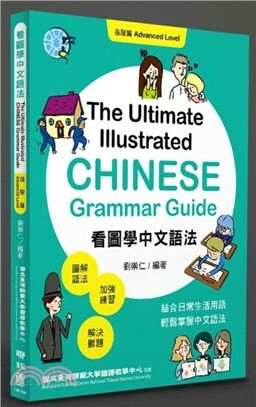 The Ultimate Illustrated Chinese Grammar Guide is highly recommended by Steering Committee for the Test Of Proficiency-Huayu, SC-TOP（國家華語測驗推動工作委員會）. The Mandarin Training Center (MTC) is founded in 1956. The MTC, a subsidiary of National Taiwan Normal University (NTNU), is the largest and oldest institution dedicated to teaching Chinese as a second language in Taiwan. The center has well-equipped facilities and is internationally renowned for its high teaching quality. MTC’s students come from all over the world, and many renowned sinology scholars and important figures in the politics and financial are its alumni. All advanced grammar points were collected and included in The Ultimate Illustrated Chinese Grammar Guide: Advanced Level, making it an excellent reference guide for advanced level students and their teachers. It is also ideal for individuals preparing for the TOCFL Band B and Chinese language learners who wish to study basic Chinese grammar on their own. It includes systematic exercises, drills, and self-evaluation tests. It can be used by teachers as a reference book when teaching Chinese. This book is designed to be dynamic and engaging to make studying Chinese more interesting and to increase student motivation. The exercises and content are designed to make preparing for the TOCFL Band B easier and to give Chinese language learners a better overall understanding of Chinese grammar. Grammar points with similar structures but with different usage and functions are arranged in the same unit or the next unit, so that learners can compare and contrast them. In addition, grammar points are integrated into topics that deal with daily life and that match with the TOCFL vocabulary found in Band B. Learners that practice the sentences patterns frequently will find it easy to apply them to their daily lives. The principles used in this book correspond to the language learning ability index. Level 3: The Level 3 test taker can read straightforward factual texts on subjects related to his/her field and interest with a satisfactory level of comprehension. Level 4: The Level 4 test taker can read with a large extent of autonomy, taking different reading strategies and speed on different types of texts. Have a broad active reading vocabulary, however, may experience some difficulties with idioms rarely encountered. In addition to illustrations and example sentences, each grammar point includes structure explanations and exercises. Learners can take the tests included in the book to determine whether they have absorbed the relevant grammar points. Three mock tests are included at the end of the book to help students get a better grasp of grammar points and build up confidence as they prepare for their test. I wish you the best of luck as you prepare for the TOCFL Band B.